There goes the trail: This photo is all you need to know about my backpacking trip. In earliest spring of 2018 -- when snowdrops were just starting to poke up through the crusty snow -- The Lovely Sarah and her parents got a unique invitation. They were invited to come to Marquette to witness a college friend's ordination as a priest. The ordination was in early June. I didn't know the future priest at all, but I did know that I was trying to complete the North Country Trail Association's "Hike 50" challenge -- that is, to hike 50 miles on the NCT in 2018. I'd tried the "Hike 100" challenge in the past and failed miserably, not because I couldn't do 100 miles in a year, but because most of my hiking miles weren't on the North Country Trail. 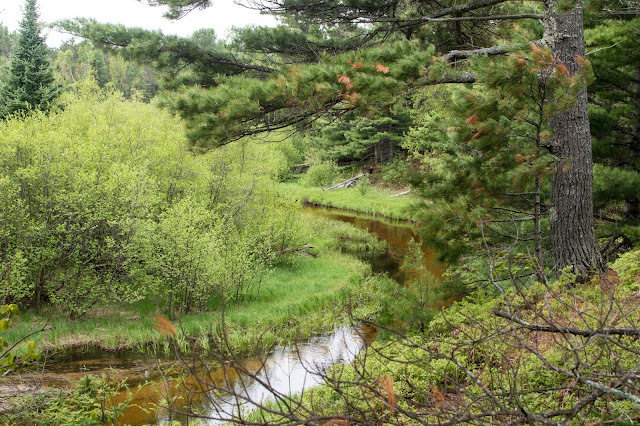 But, I thought, with a glint in my eye, the North Country Trail runs for miles along the south shore of Lake Superior, right on the way to Marquette. Plus, early June is practically guaranteed to be bug-free and chilly along the Superior shoreline. I prefer both of those situations, and so everything had lined up perfectly for a solo backpacking trip. Friday, June 1, 2018: So it was that I came to be standing alone on the side of the road just outside Muskallonge State Park, near the Lake Superior shore north of Newberry. I was glad for my raincoat, gloves, and winter hat as the cold wind blew off of Lake Superior, twirled through the spring mist that lay on Muskallonge Lake, and slammed straight into me. We had driven up to Newberry -- staying overnight at Mackinaw City, followed by breakfast at Java Joe's in St. Ignace -- and picked up Sarah's father that morning. They dropped me off at the state park and headed straight towards the ordination. 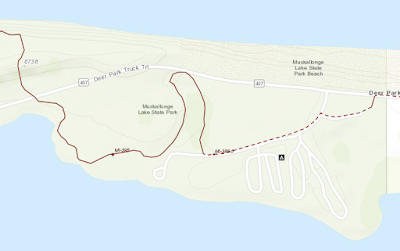 My planned hike was a point-to-point hike west along the Lake Superior shoreline, and they would pick me up tomorrow at the went end of my trail. The trail's odd passage through Muskallonge State Park. I finally gave up and followed the main road out of the park to the west, which eventually crosses the trail where it exits the park. Here at least I was sure of what I should do. The trail crossed the road and cut a clear swath north into the forest (you can see this on the far left of the map above). It bumped up and down pine-covered sand dunes until, after one last big uphill, I could see blue sky and hear the roar of the lake. 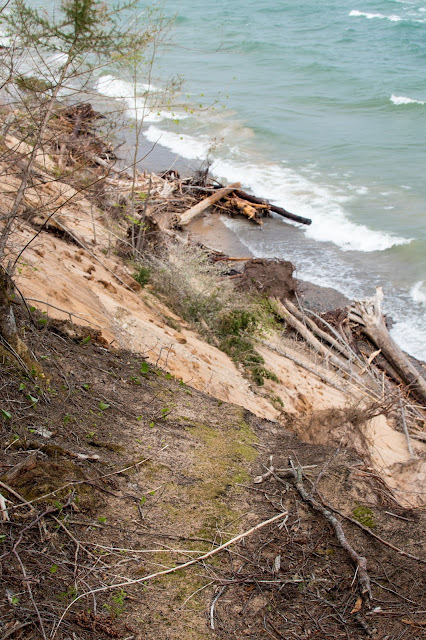 I crested the hill and almost marched directly into the lake, as the trail sailed straight off the edge of a high bluff that had collapsed onto the beach below. Can you find the trail? It's visible in this photo! The trail should have made a sharp left to follow the shore, but the bluff was severely eroded and the trail completely gone -- over the edge and into the lake. I peered into the dense undergrowth where the trail should be and saw, distantly, a short bit of trail reappearing from the bluff face. I bushwhacked around the fallen portion and was barely able to make it to the trail, which then immediately fell down into the lake again. There was more dense underbrush beyond it, and no more trail to be seen. I gave up, returned to the clear trail that I'd come in on, and pondered what to do. There's a trail down there somewhere. My maps showed that, to the west, the trail eventually came pretty close to the road. I walked back to the road and followed it west, hoping to cut in towards the trail after a little distance. I soon started seeing occasional faded blue blazes along the road -- had the trail once been routed this way? Soon, there was no doubt -- a blue-blazed cut through the trees headed straight for the lake and its eroded bluff again. I cautiously followed the trail. This time, the trail stayed up on the bluff -- barely. The trail never strayed more than a few yards from the edge, giving me nonstop panoramic views of a stormy Lake Superior as I hiked west. It occasionally dropped into the lake again, forcing me to bushwhack inland for a few yards, but the underbrush was less dense here. Even when the trail was on firm ground, it was often obscured by fallen trees. It looked like a severe storm had come through during the winter, and trail crews hadn't made it out to clean things up yet. 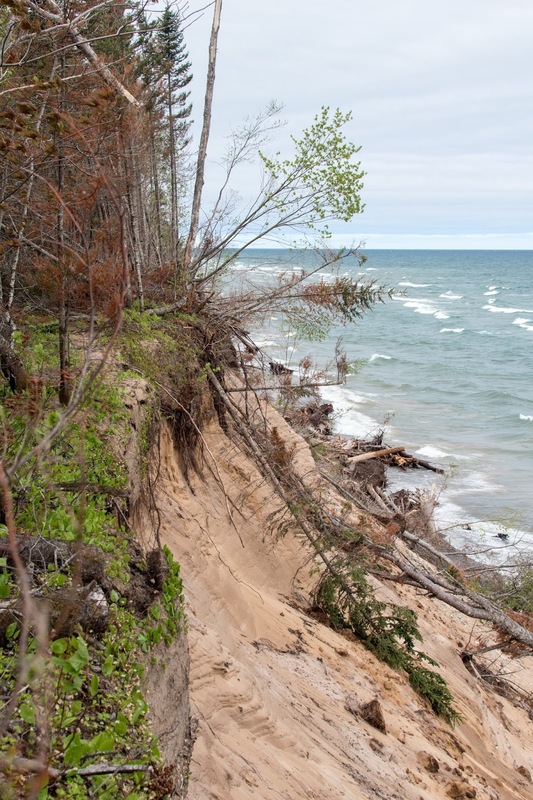 (In this part of the UP, "trail crews" probably consist of one or two dedicated retirees who haul their own chainsaw and gas for miles on foot. So, it's hard to actually complain... much.) In some places, large numbers of trees had fallen right off the cliff and were even leaning on it, with their dead branches waving just above my head. Now that I had things straightened out and had trail tread consistently underfoot, I thoroughly enjoyed the hike. The cold weather was no problem -- working hard with a full pack on my back kept me warm. It was much better than trying to stay cool on a hot and humid summer hike. As I settled into hiking mode, I started to notice more and more of the world around me. 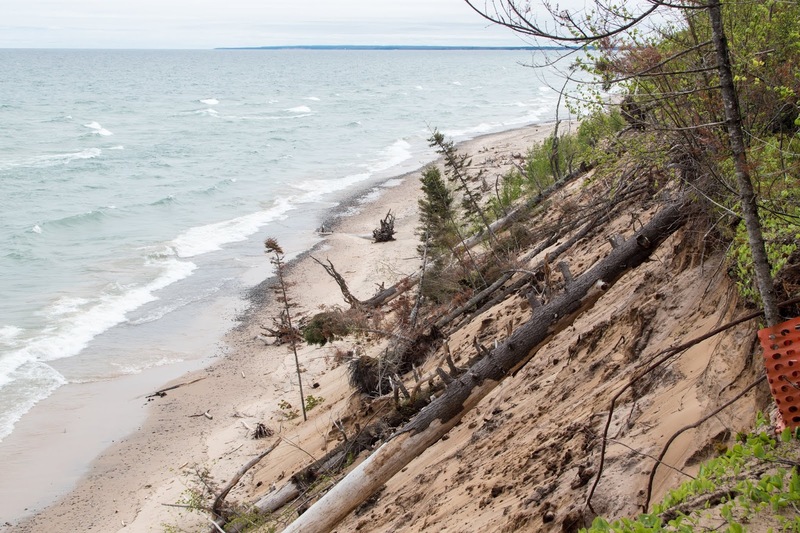 Spring was truly just beginning along Michigan's northernmost coast. 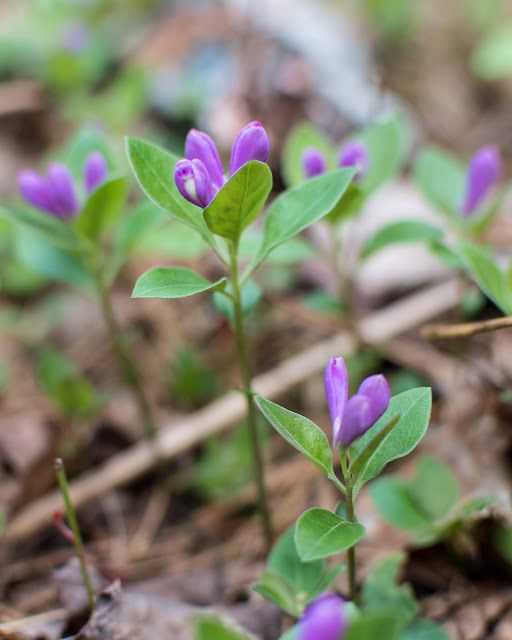 Only a few hardy wildflowers were blooming, like this one -- I think it's the vivid purple Fringed Polygala. Right next next to the shore, not even blueberries had blossoms on them yet. A few miles down the trail, I was walking along and minding my own business when suddenly, something enormous and hairy reared up directly in front of me! Wait... no, something small and feathery made an enormous fluttering exit from my path and quacked its way into the distance. 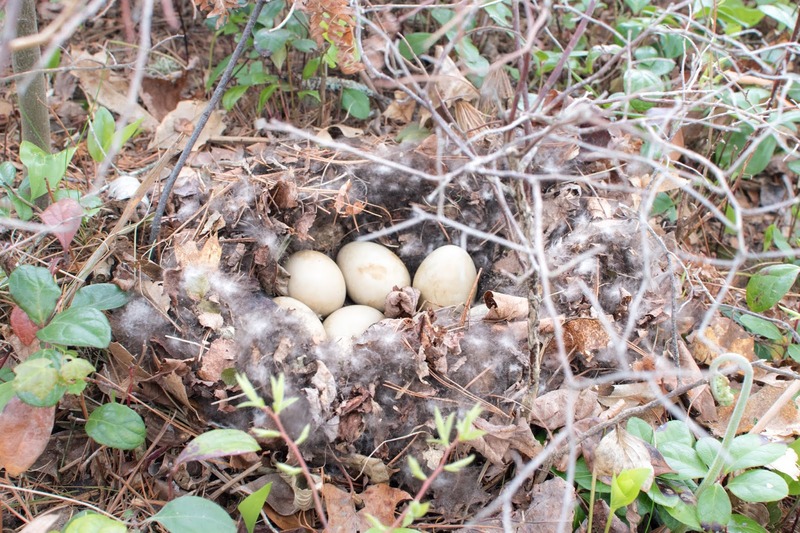 I looked around, heart still in overdrive, and found the duck's nest, right on the ground and right next to the trail. Good luck, kids, 'cause you're on your own! 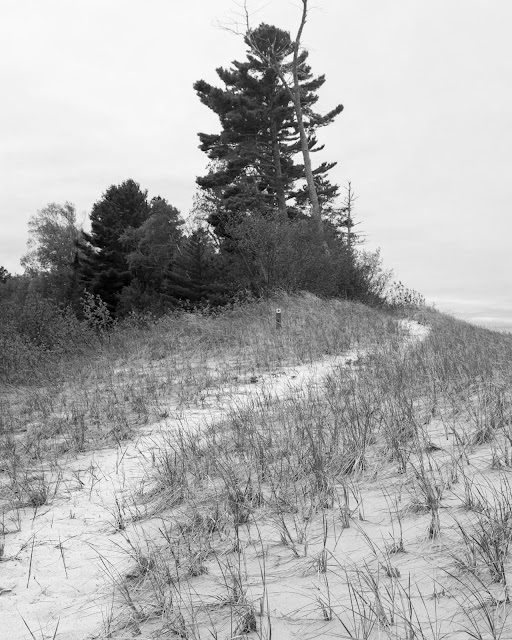 The trail soon merged with a sandy 2-track that rollercoastered its way through the near-shore ridges and swales. This section of trail was marked as a "road walk" on the NCT maps, although that hardly seemed fair -- the 2-tracks were overgrown and remote. The only vehicle I could even plausibly meet out here would be a 4x4 -- if that. 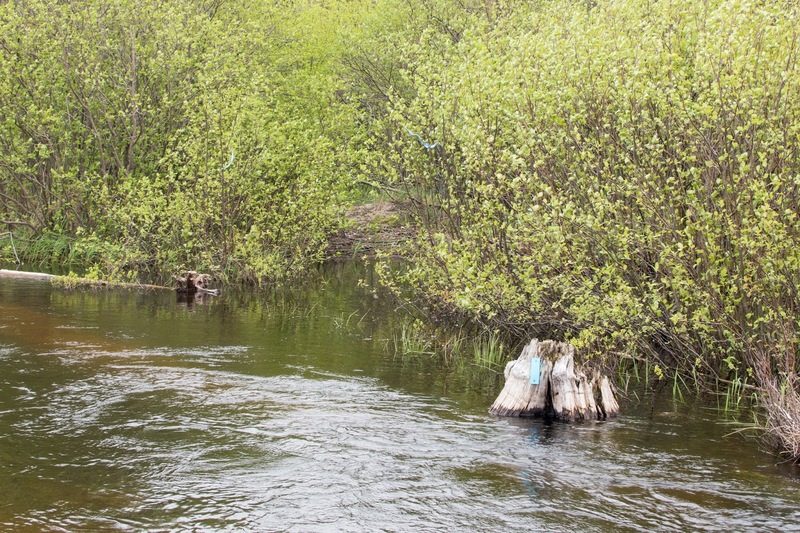 Suddenly, the trail made a sharp turn and plunged into a wide marshy area. I heard the sound of running water and realized that I'd reached the Blind Sucker River, the one real water crossing of my trip. The river was wide and marshy here. I didn't have a very good plan for this -- sandals in my backpack if I really needed them, but the cold weather and mucky river bottom made wading across the last thing I wanted to do. I backtracked and soon found a way to reach a more solid-looking part of the river bank. 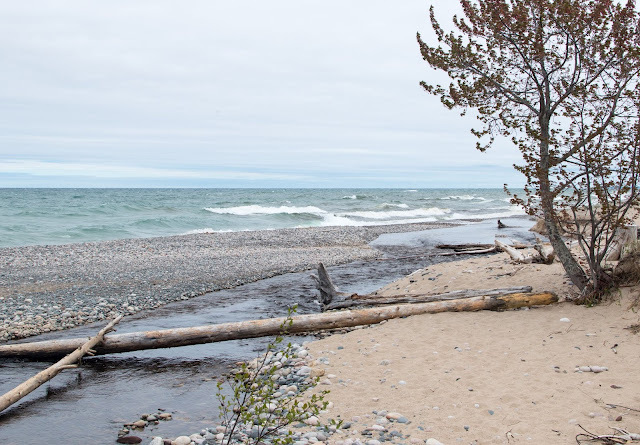 The river ran right through the rocky Lake Superior beach, which narrowed the river's channel and made its bottom more solid. What's more, luck was with me: An old tree trunk had fallen right across the river and it looked totally possible to walk across it. You think this doesn't look too bad? Try it with 30 pounds hanging off your back! I wasn't about to just heel-toe it across the narrow trunk with a 30 pound pack on my back, however. I cast around until I found two good sturdy sticks. I unbuckled my pack's hip belt and sternum strap just in case I fell off the log -- the narrow river channel made the river deeper and faster, and the last thing I wanted was 30 pounds holding me down in the rapid river. I carefully edged my way out on the log, using the sticks to keep my stability. It was just a few short steps, but I was glad to reach the other side. I left the sticks nearby, just in case someone else (or even I) had to cross back over. The intended crossing. Notice the conveniently blazed tree stump. The river enters the lake at a steep angle, leaving a narrow spit of sandy, rocky shoreline between the lake and the river. The trail followed this spit, and as I walked along, I saw the intended crossing. What do you think? The trail ascends a ridge. The trail quickly rose up onto a razorback ridge. The ridge was often just a few yards wide, and it was the only thing that separated the river from the lake. This added a new and picturesque dimension, as the views alternated between the lush river bottomland and the stormy lake, and sometimes both at once. Blind Sucker River on the inland side of the ridge. For the next several miles, I ate up the miles along this narrow ridge. The shoreline bluff slowly descended until it was easy to jump right onto the beach whenever I wanted. At this point, I met my first and only fellow hiker of the entire trip -- a middle-aged woman came around a bend, heading the opposite direction. She had no daypack, no visible water source -- but she was leaning on a crutch. She paused just long enough to say "maybe a mile" to my greeting and question, "Am I close to the Lake Superior campground?" (my goal for the night), and then continued on. The trail eventually met a well maintained dirt road that paralleled the lake. This was a continuation of the road where Sarah and my father-in-law had dropped me off earlier today. A sign pointed me towards the Blind Sucker campgrounds, which were a mile or so south of the road. They were my alternate camping spot, in case my real goal -- the Lake Superior State Forest campground -- was full. The trail continued through a well-used section of shoreline with many parked trucks and couples wandering along the beach. 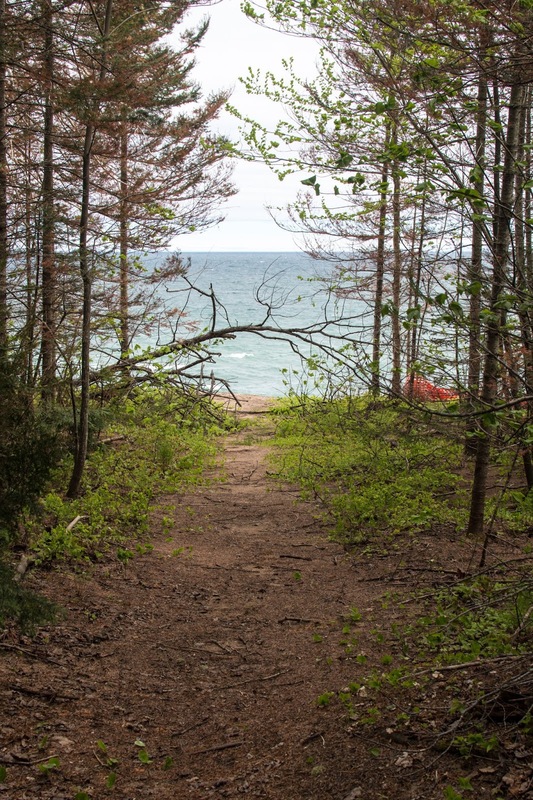 Very soon, I entered the Lake Superior State Forest campground, snuggled between the shoreline and road. This campground is cut from the same mold as the rest of Michigan's many state forest campgrounds. A dirt road leads past well spaced sites, with a short loop for a turnaround at the end. Every site has a fire ring and a picnic table, and nothing else. There are a couple of outhouses, a hand pump for water, and a self-registration station. I noticed how cold many of the sites were, with the chilly lake breeze blowing right across their tent pads. I kept walking until I found site 16, in the loop at the end of the road, with a nice high hill blocking it from the breeze. I dropped my pack, hoofed it back to the self-registration station, and filled out my registration form. That and $15 got me a night in the campground. After a few minutes of chit-chat with a maintenance guy who was cleaning up sites after the long winter, I headed back to site 16. Site #16 with my tent staked out against the wind. There were few other people set up in the campground, and we were all well-spaced-out from each other. That was fine by me -- I was out here to enjoy nature and silence, not generators and cow-shaped strings of lights. I sat down at my newly acquired site and looked around. It was a lovely place, surrounded by trees and still within earshot of Lake Superior. As I sat quietly, a deer cautiously appeared out of the woods and nosed around the next site over. I silently communed with nature, until a truck hauling a giant trailer blasted past on the road, which was just a few hundred feet beyond the end of the loop. The deer bolted, and I got up to set up my tent. With camp set up, I set out to explore my surroundings. Even after a good long hike -- 7 miles today -- I rarely feel like just sitting down and doing nothing. With Lake Superior just a few dozen feet away, I couldn't stay put. 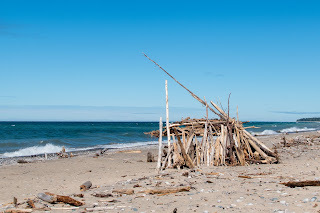 A short path up and over the hill popped me out at a wide beach that was buried under piles and piles of driftwood. The same storm that had blown down so many trees along the trail must have left trees floating in the lake too, because the beach was absolutely covered with huge weather-worn driftwood. In the distance, east along the beach, I spotted an odd construction. As I picked my way closer, I saw that there was some sort of teepee or pyramid made of driftwood. 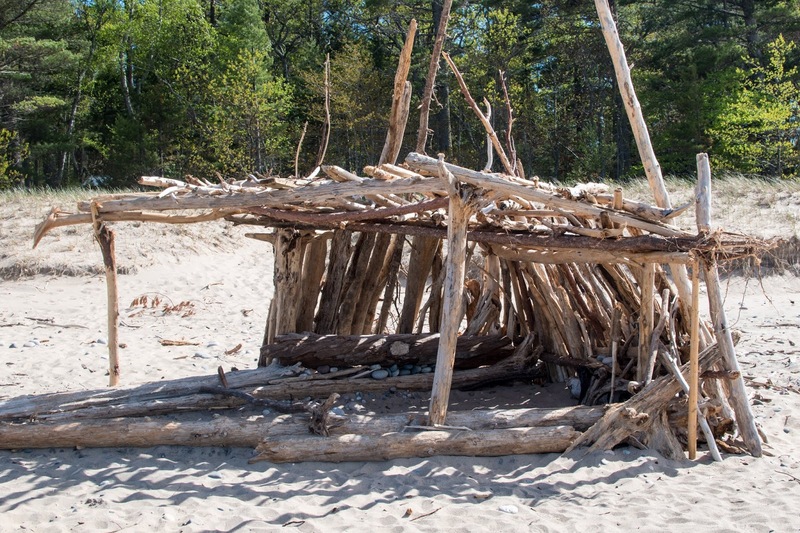 Even closer, I realized that I was looking at a giant driftwood tiki hut, complete with benches, back rests, and a roof. Somebody (or many somebodies?) had put in quite a bit of work to construct this lovely (and remarkably stable) hut. I examined it from every side before deciding that it was structurally sound. Inside, I relaxed on a remarkably comfortable bench -- and realized just how much my legs and feet were screaming at me. My stomach was starting to grumble, and with no waiter appearing to bring me an appetizer and cocktail, I headed back to my site to make my own. The cocktail was hot tea to chase away the cold. Dinner was freeze-dried "Chili Mac with Beef", A Mountain House meal that I'd been storing away for a solo trip (because Sarah was disgusted by the very thought of it). She had a point: the chili mac had an unnaturally bright red color that stained everything it came in contact with, including me. I washed out the bag it came in and saved it, to help me make breakfast the next morning. Try as I might, I couldn't get the bright red color out of the bag. I resigned myself to a breakfast of bright red oatmeal. After dinner, I enjoyed one of the luxuries that my $15 camping fee purchased: I went to a trash can and threw away my trash. After that, I went to a hand pump and pumped myself a full supply of cold, fresh well water -- no filtering required. Those two alone made the camping fee completely worth it. The temperature had never been particularly warm today, and as the sun headed toward the horizon things were only getting colder. I made another cup of tea, grabbed my Kindle, and headed out to the beach to enjoy the last few minutes of daylight. I sat with my back against a driftwood log, warming in one of the last rays of daylight, and read a few chapters. 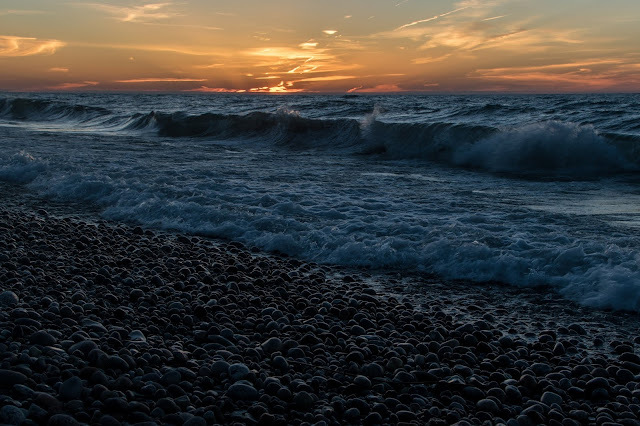 The sunset itself was merely OK, but relaxing on a beach next to the roar of Superior was well worth it. After that, I took care of my last few camp chores. The main one was setting up my bear bag. For this trip, I'd purchased a new Ursack, a bear-proof bag that could be tied directly to a tree without having to go through the whole ordeal of finding a good branch to hang it from. I put all of my food inside the smell-proof liner bag, tied the opening tightly shut per the instructions, and tied the whole bag around a smallish tree a way from my campsite. After a hard day of work followed by a hard afternoon of relaxation, I was ready for sleep. I climbed into my sleeping bag and curled up for the kind of rest that only comes after a day of backpacking. A few hours later, I woke up, chilled through to the bone despite the fact that I was wearing all of my layers (including a hat). 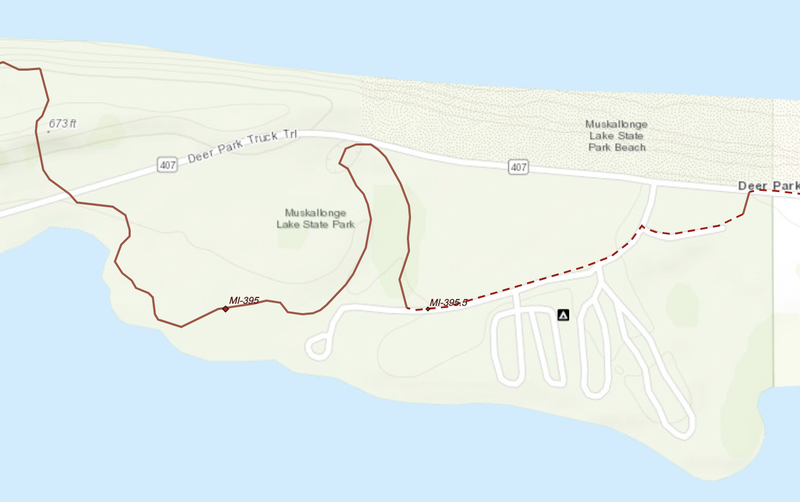 I realized my error quickly: One reason that this site was so well protected from the lake breeze was that it was lower than the other sites nearby. 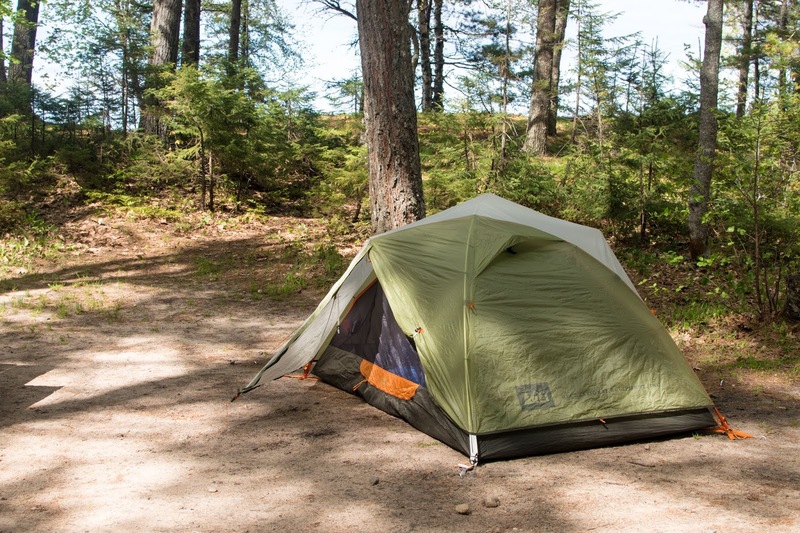 Well, the lake breeze had died off after sunset, and the cold night air had settled into the little hollow where my tent was pitched. I had set up my tent in a refrigerator. I did a burst of sit-ups, still in my bag, to generate some extra heat. When that started working, I quickly zipped the bag right up tight around me, leaving only my nose and mouth exposed. It was going to be a long, cold night. Great to see you have started a new blog! Eagerly awaiting the next installments. Next installment is posted! Sadly this is the last backpacking trip I have to write about... until next year. Thanks for putting that link on flickr.....I really enjoyed your hike blog and the pictures. We really had some wicked storms all along the Superior shore this year. 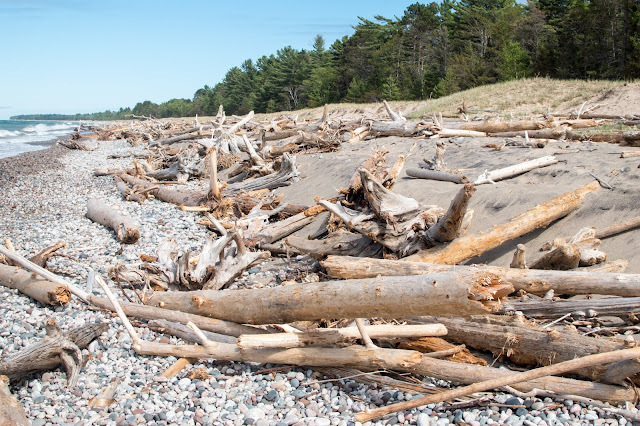 At Park Point in Duluth we also have thousands of drift wood logs piled along the shore. We visited a friend who has a cabin west of Ontanogan. We went down for a quick look at her beach...it was gone! In Duluth we had 2 Gale force storms which caused $18 million of damage along the lake front. On a better note, I really enjoyed the pictures along your route as I spent a lot of time along that shore from Whitefish Pt to Munising fishing for trout on some of the streams and hiking along the Pictured rocks and Grand Marais Dunes.